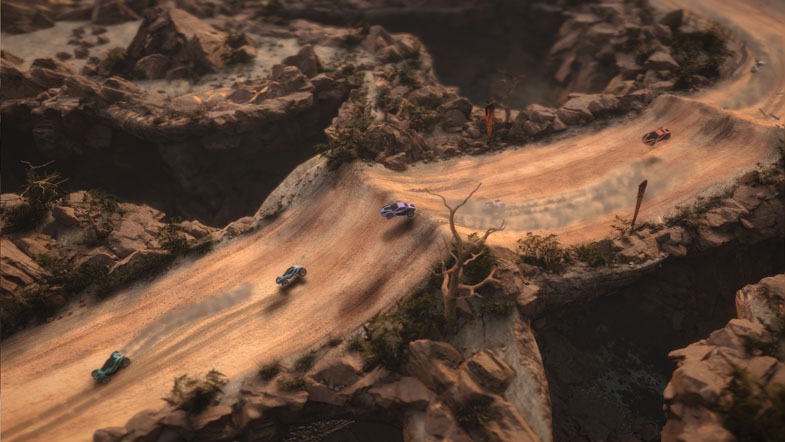 Mantis Burn Racing is a racing game developed by VooFoo Studios that puts an emphasis on the simplicity of arcade-style racing games. This is the kind of racing game that anyone can easily pick up and play, because it comes without all the frills and feature-bloating that AAA developers like to put into their racers. With tight controls and a fast-paced playstyle, Mantis is a throwback to when the only thing that mattered in a racing game was being the first to cross the finish line. The question, for me anyway, is whether or not this kind of retro approach to racing games will capture my modern gaming tastes. My experience with Mantis was enjoyable but imperfect. I do think it could keep the affection of people looking to compete in an old-school racer. The driving mechanics are more than solid in Mantis. Timing a drift around a corner and overtaking the car in front of you can make for some cool moments. It’s a simple approach to a racing game, but it makes it accessible to players without a ton of experience in racing games. 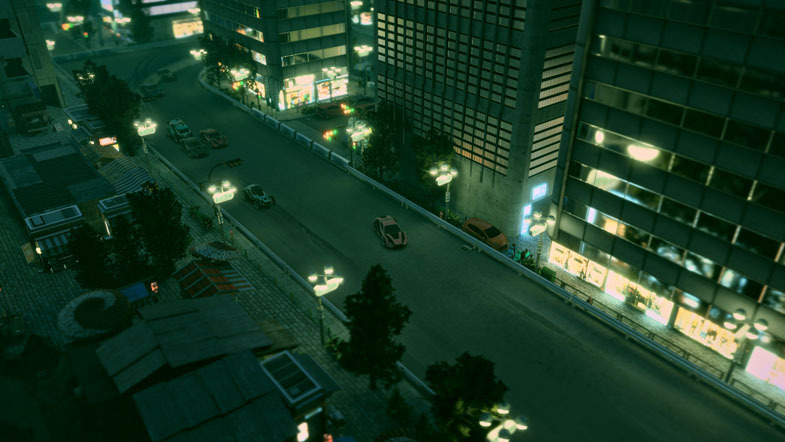 The nuance lies in drifting and getting a feel for the map’s upcoming twists and turns. These are skills that will build over time, as will your comfort with the old-school top-down perspective, but I do wish there were more interesting ways to gain ground on your opponents or interact with them in general. The speed boost you build up through experience is short-lived. It doesn’t make a big impact on your placement unless you use it at the perfect time, which is going to be a rare, small window of opportunity. I also think that Mantis could inject a bit more chaos into its formula. I’m not saying I want banana peels and turtle shells to start getting tossed around the track, but I couldn’t shake the feeling that I wanted more to do in the race than hit tight corners and occasionally use my speed boost. Bumping into competing cars doesn’t have much tactile feedback to it, and it often means pushing your opponent ahead if you hit them from a wrong angle. These generic mechanics add to Mantis's vanilla feel, even if it has nicely responsive racing controls and driving mechanics. If you’re way out ahead of your competition, it seems like the only way to lose is to make such a bad mistake that you quit going forward. Outside of that, there aren’t many ways for the cars behind you to catch up to you. So… avoid running straight into big rocks. The progression system in Mantis leaves a lot to be desired, and there’s a couple different reasons for that. From the small-scale progression of building up your speed boost ability, to the vehicle upgrades that you apply throughout your career, none of it feels all that meaningful. After adding several upgrades to my vehicles, I couldn’t really tell what difference those changes had made. There are twelve total vehicles in Mantis fifteen when you count the Battle Cars that can only be used in the DLC of the same name. That’s a good bit of variety, with each vehicle falling into a category of lightweight, midweight, or heavyweight. Many racing events will prevent you from using a certain weight class, but there are also many game modes that let you take your pick from the entire garage. Where I wish they would have gone further is with the aesthetics. The vehicle models look sharp and decently detailed, but you get to pick from one of only about a dozen paint jobs, all of which are a solid color. Other than choosing the color of the flame trail from your boosters, that’s all you’ve got for customization. I know that it’s unreasonable to expect Warframe-levels of aesthetic options in all my games, but I was hoping for a little more to make me feel connected to the progress I’ve made. Loading in upgrades to the suspension or the engine is okay for incremental progress, but if they’re trying to put RPG mechanics into their racing game, you should be able to work towards that cool, unlockable racing stripe, or toward the cheesy flames that you can slap onto your new, equally cheesy spoiler. Cosmetics certainly don’t make or break Mantis, but it's something I hope to see more fleshed out, both in the vehicle customization and in the level design, in future updates. Mantis succeeds in its attempt to be the straightforward racing experience that gamers have been missing. If you’re turned off by other racers because of all the tiny details that motorheads love, then Mantis is one of the best options out there for you. It’s a competitive game with a solid player base that makes you earn every inch you gain out on the racetrack. I do believe there’s room for a bit more depth and perhaps a bit more unpredictability in the gameplay loop, while an update to the customization system could do a lot to make progression feel more tangible. The Battle Cars DLC is a nice distraction, but it doesn’t quite take the title beyond vanilla. Mantis a fun title that can be played casually, just trying to best your previous times and unlocking new vehicles. Or, you can take your skills online and race against the best controller-drivers in the world. Either will make for a solid racing experience, even if there isn’t anything terribly ambitious going on here.